Two exclusive tracks, controversial artwork and politically charged lyrics. Its no secret that THE CLASH were a huge influence on the US BOMBS and Joe Strummers death in 2002 left a permanent void in the hearts CLASH and US BOMBS fans alike. With two ripping renditions of CLASH standards "Straight To Hell" and "Death Or Glory," the US BOMBS pay tribute to one of the bands that started it all. What better way to celebrate the re-birth of the US BOMBS than by visiting the roots. US BOMBS need zero introduction. This loud, snotty, street/skate punk from the Master of Disaster himself, Duane Peters, and his crew is both timeless and timely in a world drunk on politics and power. US BOMBS will be visiting your town, or someplace close, during 2018 and beyond. Road Case's opening track, "Riot Sirens" is classic U.S.Bombs all the way and when the Master of Disaster, Duane Peters, starts off with a line like, "Tonight's the night, be ready for a riot." you know it's time to buckle up and take a ride with him and the boys. Guest appearances by some friends from The Blankz, The Father Figures, and Meat Puppets, came to this recording ready to rock (and write) another chapter in the illustrious history of the band that can't be broken. 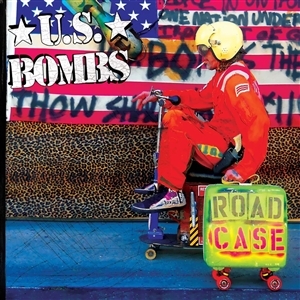 12 strong tracks with the classic Bombs sound and some varied as London Calling!